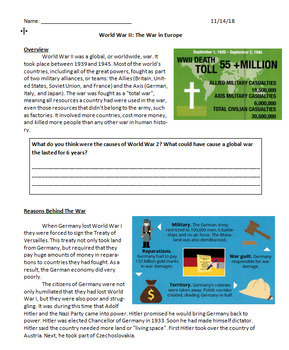 In this lesson students will be able to identify the circumstances that caused World War 2, the events of the war and its ultimate conclusion. Throughout the reading, there is any opportunity for students to reflect and analyze through their own writing. There is also an opportunity to read 'The Bear that Wasn't' (link provided to the story) and reflect on the short story, which shows human's desire to be part of a group and that the group has the potential to be exploited by men with power and agendas. 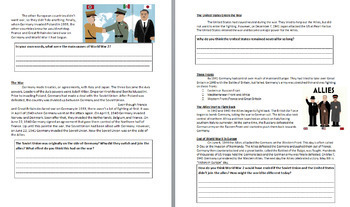 There is also a short activity and video dealing with Nazi concentration badges, which connects to the theme of the short story. The lesson is differentiated for lower level and SpED students with shorter readings and italicized text, and is also translated into Spanish for ESL students.